Welcome to the FIRST SOTM Blog Hop of 2011!!! If you're like me, you're still in shock that another year is over and a new year is here!!! We're starting the year (and new decade) out right with the SOTM Blog Hop using Find Your Style. There are over 50 consultants this go-round and I'm sure they will all have some awesome artwork to share as well as some sneak peeks into the NEW Idea Book that will be available February 1st....some of which is available starting TODAY!!! Now...let's get started! 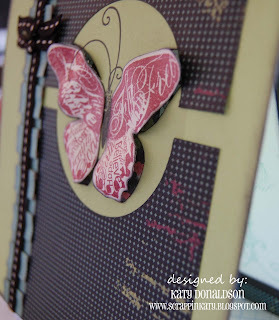 Here's a view of the stamp set....aren't those images GORGEOUS!!! If you've come from Michelle's Blog, you're on the right track....If you get lost along the way, try going to Helen's Blog for a complete list of consultants. 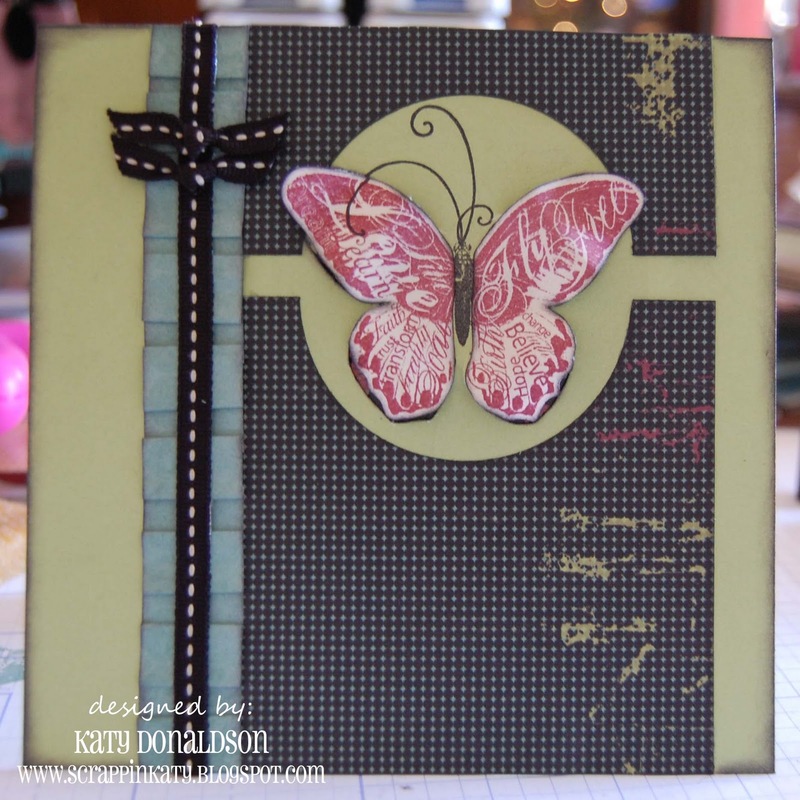 I decided to go with a 6x6 card using the butterfly image and Wings Paper Packet (NEW and available for purchase TODAY!!! )....I pleated some B&T....BUT ONLY because I didn't have the NEW pleated ribbon!!! That's right....PLEATED RIBBON!!! Here's a closer view....isn't that butterfly B&T awesome! And, of course, I had to decorate the inside...LOVE the dress form image!!! 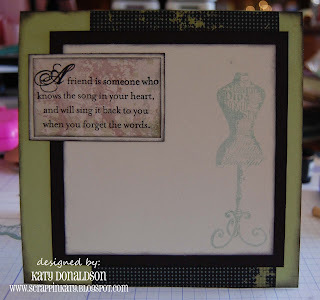 That's all I've got for now but I'm planning on playing with this stamp set some more over the LONG weekend! Now hop on over to Wanda's Blog and see what she's done with this stamp set! Don't forget to contact your consultant to order this stamp set as well as the Wings Paper Packet that is available NOW!!! If you don't have a consultant, feel free to check out my website and your order will be shipped directly to your home or office. P.S. 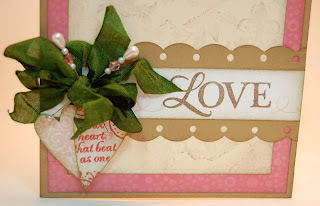 I got the inspiration for my card from the PaperCanvas Blog....one of the many things I love about blogs and sharing!!! Aren't these the CUTEST thing!!! 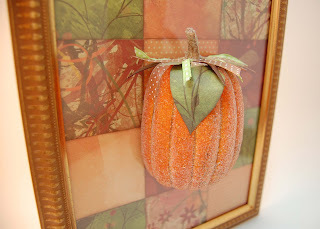 Believe it or not, they are SUPER EASY to make as well! I was hoping to get a picture of them all pretty in the basket but they were eaten so fast, it never happened!!! Luckily, CTMH has this wonderful card kit....Festive Memories....otherwise, my family might've not received cards this year. We have been SO BUSY...it just seems like I can't catch up...I meet myself coming or going...or whatever that saying is...lol. This is what I sent out to our family and everyone else will probably be getting New Year's cards...lol TK was such a ham in this photo shoot...he just cracks me up!!! CTMH made it SO EASY for me this year!!!! Thank you, Close To My Heart! in my HOUSE at least....West Texas is expected to continue with the mid to high-70-degree weather so it definitely isn't going to FEEL like Christmas!!! Last year it actually snowed on Christmas Eve...it was a PLEASANT surprise...one that I would gladly welcome again! We put up and decorated our Christmas tree last weekend and I thought I'd post pictures since everything I'm "creating" these days are for gifts and I don't want to post pictures of those 'till the recipients have a chance to open them. A little peek at my boys acting silly during our Christmas Photo photo shoot...silly boys! I held my my annual Christmas Card Workshop last night with a total of 8 women attending and my dear friend and sideline, Sylvia, helped me out! It was FUN and we got our Christmas Cards made and ready to send out! To take a little break from all the hustle and bustle of Christmas, today we are going to focus on AMORE! This month's blog hop will take you to a little over 60 consultants' websites and show you multiple uses for the December SOTM, Amore! So...let's get started! Here's what the stamp set looks like....cute, huh! 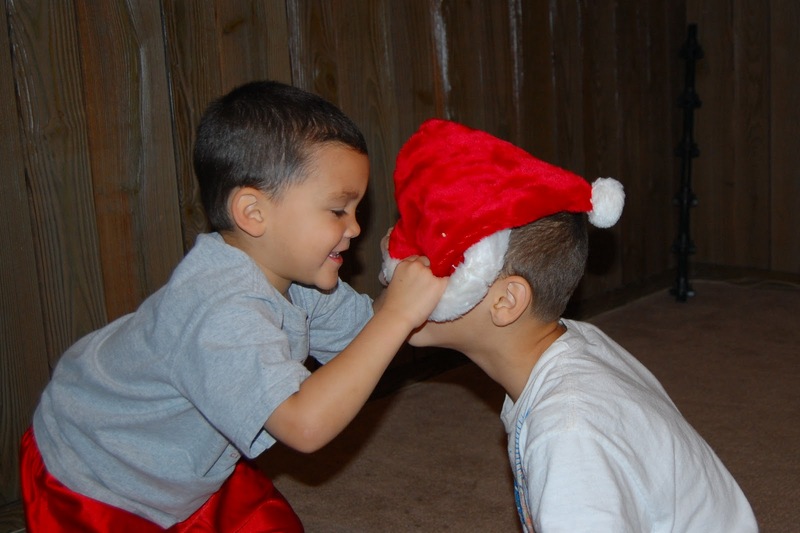 If you've come from Carla's Blog, you're on the right track. Don't forget to go all the way around to where you started. If you get lost along the way, you can always find a full list of participants on Helen's Blog. 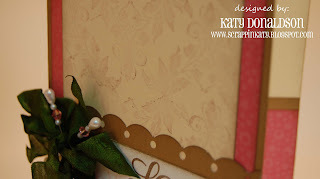 I bought some Seam Binding Ribbon online and dyed it with Olive Reinker. 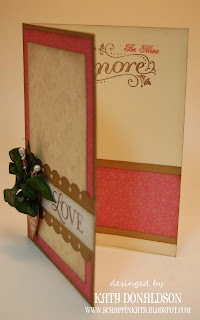 I used some of our Pretty Pins to add a vintage look and then stamped some Heart Dimensional Elements with some images from the SOTM for added dimension...The scalloped border was made using our Corner Rounder and an 1/8" hole punch...it's a good way to improvise. Thanks for stopping by! 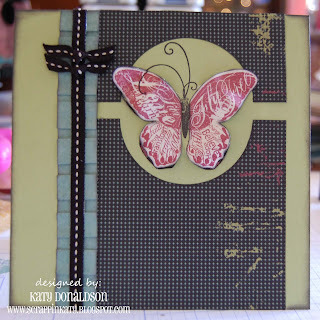 Now, keep hopping on over to Krista's Blog and see what fantastic thing she has to share! 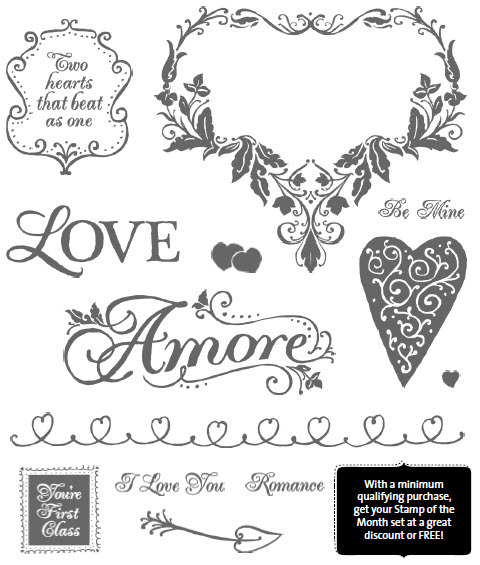 Don't forget that you can order this stamp set during the month of December! Contact your consultant or e-mail me to find out how you can even get it for FREE!!!! I basically lifted the idea from page 86 of the Autumn/Winter Idea Book and from Annette Green using CTMH's Mix & Mingle Album. My girls LOVED it!!! 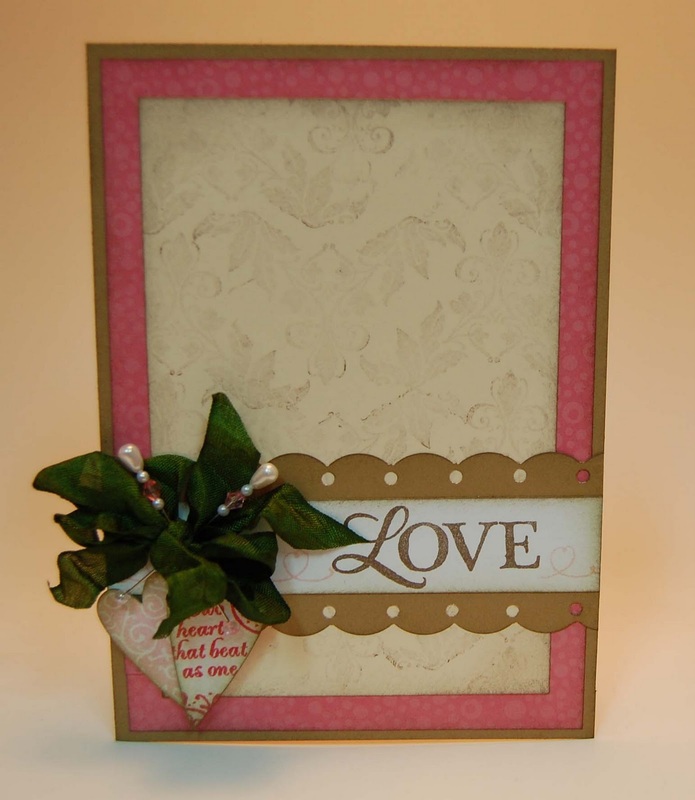 For the "FALL" side, we used Olivia Paper Packet, Mocha and Pearl Opaques, Shimmer Designer Brads, Monogram Dimensional Elements, Harvest Home Stamp Set, Timeless Stamp Set from the Olivia WOTG Kit, Blending Pen and Watercolor Pencils and Finishing Files for all the intricate sanding around the scallops, corners, etc. For the "JOY" side, we used Mistletoe Paper Packet, Mistletoe Level 2 Assortment, A Timber Stamp Set, I Believe Stamp Set, more Pearl Opaques, more Dimensional Elements Monograms and, of course, Finishing Files. 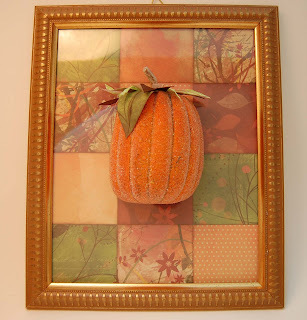 Remember this post when I said I had a pumpkin wall decor to share...well, here it is! 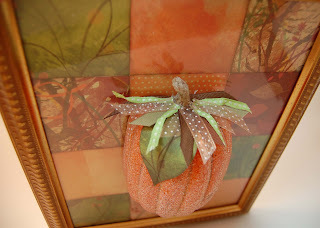 I used Oliva Paper Packet...left the DOLLAR frame the color it came and add various ribbon at the top. 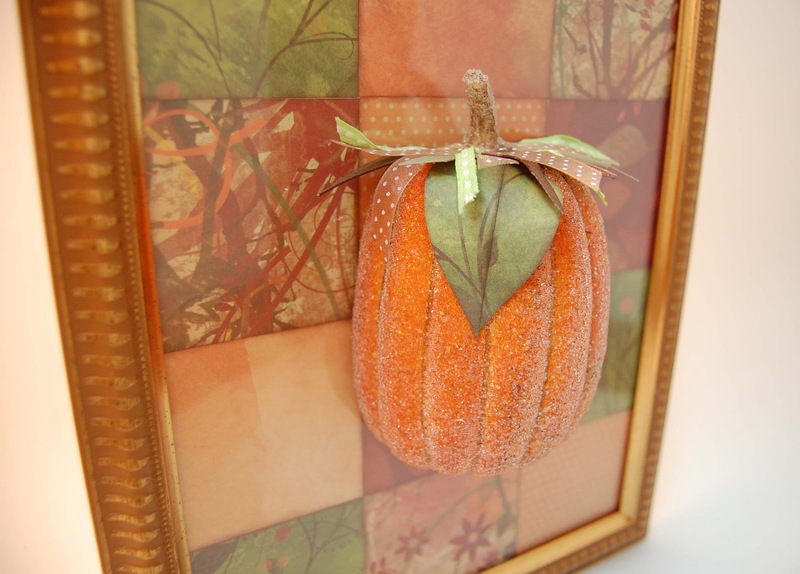 I can't believe this weekend has been FULL of pumpkins and costumes, candy and sweets....and NOW, it's time for November!?!?! 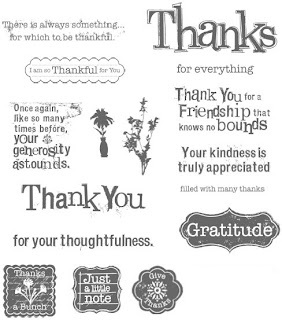 I'm busy getting into the season of "gratitude" and this month's SOTM is perfect for just that! If you've come from Annette's Blog then you've seen her SUPER CUTE cards (LOVE that coffee cup), you're on the right track!!! 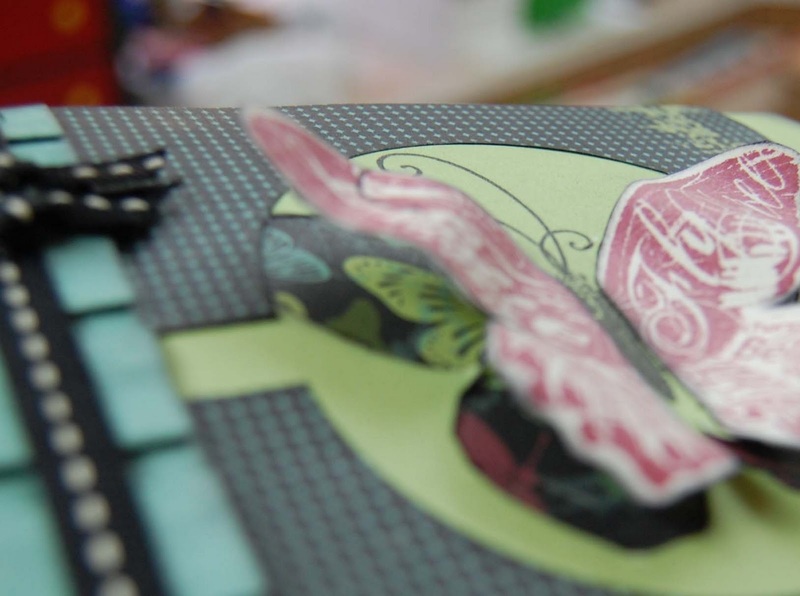 Keep hopping along 'till you see all 60+ consultants' blogs and what they have done with this wonderful stamp set! If you get lost along the way, you can always go back to Helen's Blog and she'll have a complete list where it'll be easy to pick up where you left off! Are you ready to see what I've done with this stamp set???? It's one of my FAVORITE things to do with "word stamps"...why pick just one when you can use them ALL! 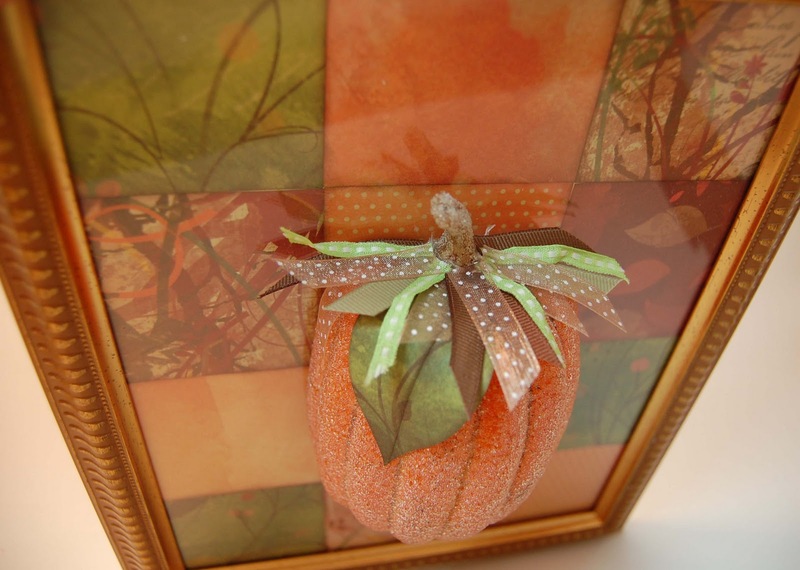 This little home decor item can be used to display during the month of November for Thanksgiving or you can give it to a coworker, friend, etc. 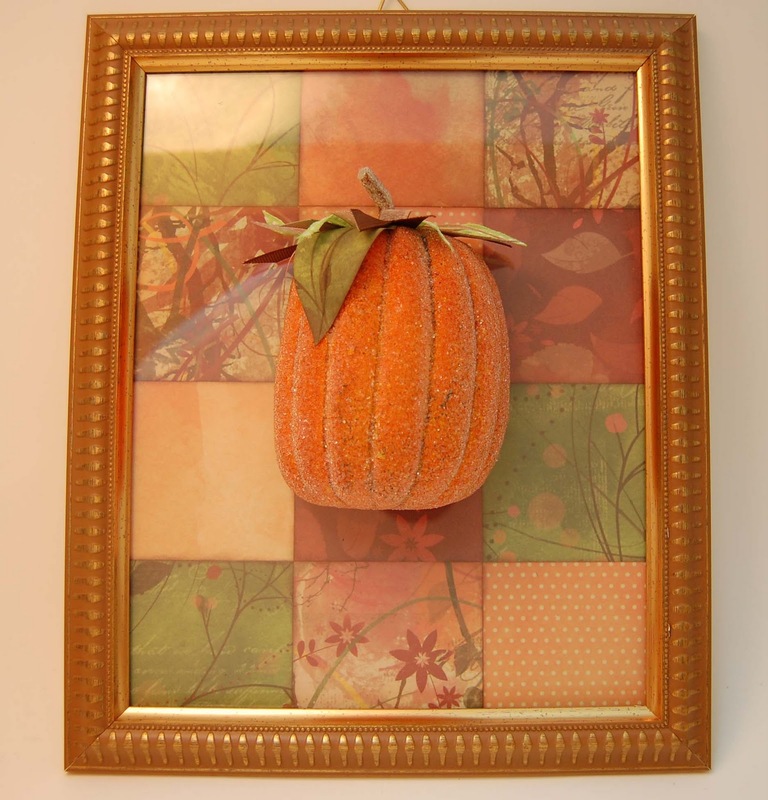 as a "thank you" for taking you out to lunch....maybe carpooling with you...and when the frame cost only $1 at the Dollar Tree...this gift is VERY affordable! All I did was lay out all the images I wanted to use from this stamp set face down on my piece of paper (this one happens to be a 4x6 picture frame with an opening of about 3-1/2" x 5-1/2"). Once I knew that all my images could fit and where I wanted them, I loaded them onto blocks, one by one, inked them up and stamped them! 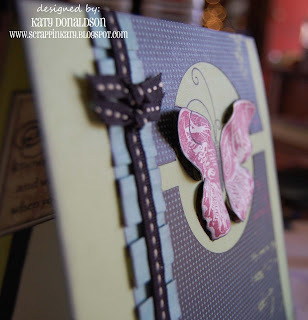 HINT: Cut a second piece of paper measuring 4x6 and use that to stamp on...that way your 1st piece will still contain all the stamps in the exact places you want them! 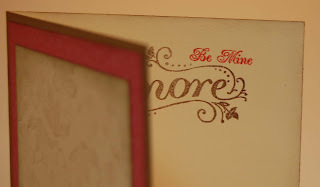 That's all I have for you this go-round....make sure you hop on over to Adeline's Blog and see her CUTE card...you're gonna LOVE IT! 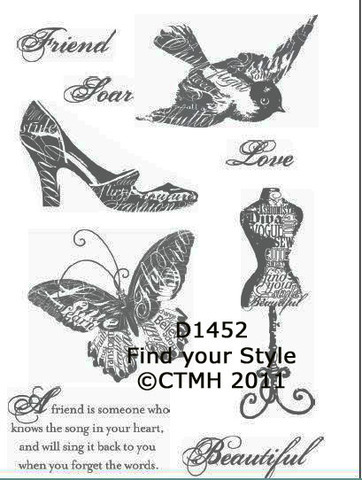 Don't forget...this stamp is available all month through your CTMH Consultant. What...you say you don't have a Consultant??? We can't have that now! 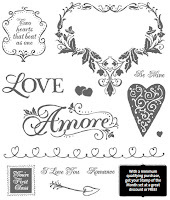 E-mail me to find out how to get this versatile stamp set for FREE!